If you are a long-time reader, you may remember last year when I posted pictures of my student name tags for my classroom tour. They were printed, laminated, and taped to the backs of my students’ chairs! By the end of the year, their name tags were still intact, and most of them still in perfect condition! 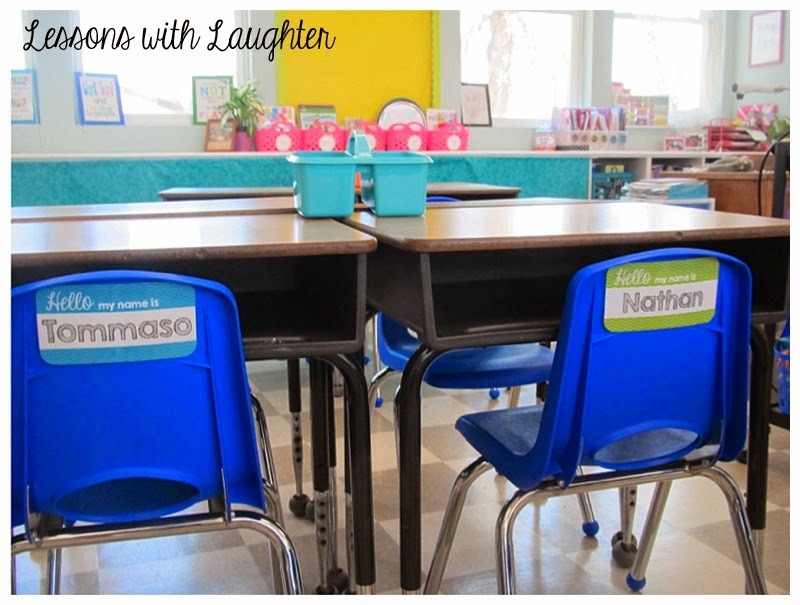 Now, I know that this won’t work for all teachers, especially those in primary grades whose students need to actually see their names in print or cursive, however for my 4th graders, putting their name tags on their chairs was a perfect solution to the not-so-pretty-when-they-got-destroyed-on-desks name tags! I made an editable file and posted it to TPT for all of you who have been asking about them! We don’t go back to school until the end of August and I can’t get back into my classroom yet, but I was excited to get an early start on my back-to-school creating! I’m sure I’ll have to print a couple more name tags before the first day of school, but I’m glad to have the majority of them finished and ready to go! I love that idea, Molly!! I might have to try it in my classroom too!! This is a great idea. The name plates are just beautiful! How would you suggest using name tags with switching classes? I love the idea of them, but can't figure out a good way! Those are so cute, and what a great idea to save the wear and tear and the name plates! Totally cute and a great way to avoid the "messyness" of them getting destroyed on desktops. Plus, they just move the chair when they go to another desk! Brilliant!! Thanks for sharing!! BTW, what font did you use for the names on your tags? I've been searching for a font like this one to use in my scrapbook creations!! Thanks again!! How did you tape these to the back of the chair? Packaging tape? Did you just loop and stick it to the back? That is exactly how I did it! Two loops, one on either end! It has held up all year! I can’t figure out how to type names into it….